In the heart of the old town of Orosei you reach this one-room apartment through the passage of an old archway and courtyard which reveals views of other old buildings of the late 18th century. Due to the peculiarity of the location and its location (a few meters from the museum, churches, squares), the work has been handed over to an architect experienced in the restoration and renovation of historic houses and buildings. Originally the room was used as a storehouse of simple agricultural tools for producing wine and for storing grain sacks. Through a skilled remodeling and expansion of the room with a floor space of 30 sqm, the ground floor was designed for the living area with kitchen and bathroom while a gallery of 10 sqm with a double bed serves as a sleeping area. 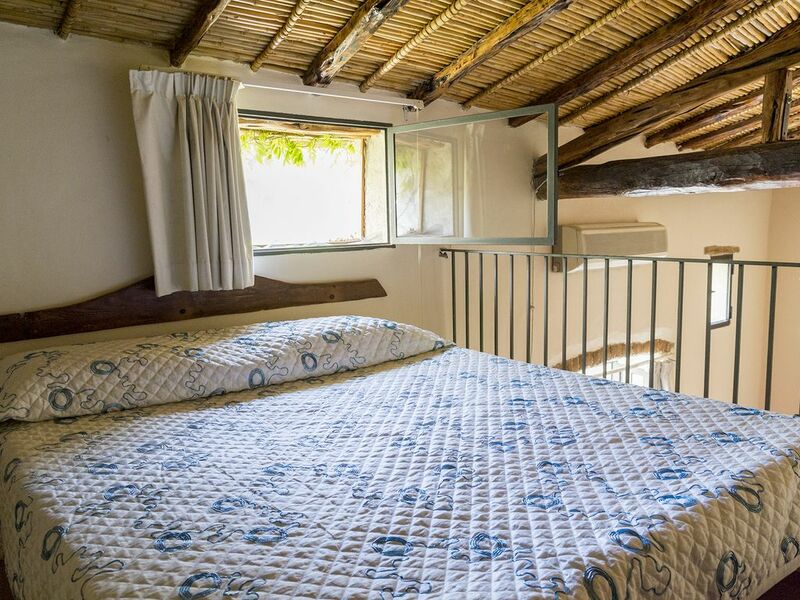 The ceiling has traditionally been covered with reeds (nowadays with modern, safe and durable materials), partially hidden by pipes and beams serves at the same time as insulation. The apartment has its own entrance and is equipped with air conditioning, an outdoor shower and barbecue in its own small courtyard. "The place was marvellous, in a genuine old building with character. The house was situated just two steps from to the town centre, but in a very quiet place. Inside it was pleasant and well equipped, just as described. Everything was very well arranged, useful and stylish at the same time. The owner is particularly kind and very helpful. We were delighted with our stay in Orosei." Individuell gestaltete Einraumwohnung mit guter Ausstattung. L'appartamento è perfettamente corrispondente all'annuncio: per due persone è molto comodo e spazioso. E' situato in pieno centro storico in una corte appartata ed affascinante, vicino a tutti i servizi e ad un parcheggio nel quale, nonostante fosse agosto, non abbiamo mai faticato a trovare posto per l'automobile. Molto carino anche il piccolo giardino dotato di barbecue in muratura e doccia esterna. Inoltre Franco, il proprietario, è sempre stato estremamente disponibile e cordiale, gentile e molto simpatico, veramente un valore in più al soggiorno. We enjoyed our stay at this apartment, which is located in the very heart of the old town and beautifully restorated. There is every equipment needed and the most beautiful beaches are close (by car).